He was born in Sudbury, Suffolk, the youngest son of John Gainsborough, a weaver and maker of woollen goods, and his wife, the sister of the Reverend Humphry Burroughs. 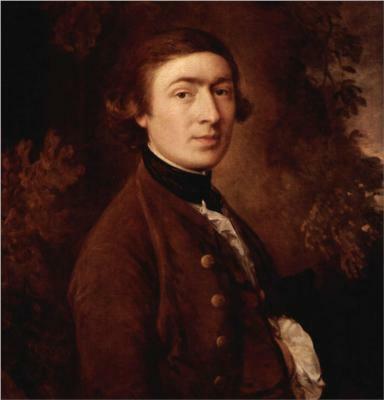 One of Gainsborough's brothers, Humphrey, had a faculty for mechanics and was said to have invented the method of condensing steam in a separate vessel, which was of great service to James Watt; another brother, John, was known as Scheming Jack because of his passion for designing curiosities. 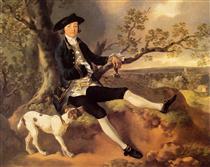 The artist spent his childhood at what is now Gainsborough's House, on Gainsborough Street. He later resided there, following the death of his father in 1748 and before his move to Ipswich. The original building still survives and is now a dedicated House to his life and art. When he was still a boy he impressed his father with his drawing and painting skills, and he almost certainly had painted heads and small landscapes by the time he was ten years old, including a miniature self-portrait. 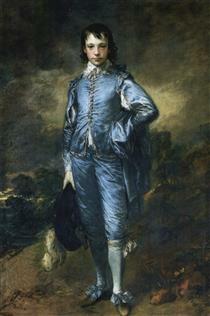 Gainsborough was allowed to leave home in 1740 to study art in London, where he trained under engraver Hubert Gravelot but became associated with William Hogarth and his school. He assisted Francis Hayman in the decoration of the supper boxes at Vauxhall Gardens, and contributed to the decoration of what is now the Thomas Coram Foundation for Children. 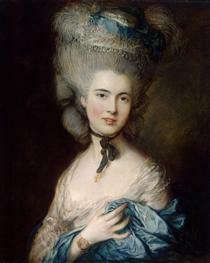 In 1746, Gainsborough married Margaret Burr, an illegitimate daughter of the Duke of Beaufort, who settled a £200 annuity on them. The artist's work, then mostly consisting of landscape paintings, was not selling well. He returned to Sudbury in 1748–1749 and concentrated on painting portraits. In 1759, Gainsborough and his family moved to Bath, living at number 17 The Circus. There, he studied portraits by van Dyck and was eventually able to attract a fashionable clientele. 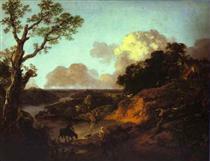 In 1761, he began to send work to the Society of Arts exhibition in London (now the Royal Society of Arts, of which he was one of the earliest members); and from 1769 he submitted works to the Royal Academy's annual exhibitions. He selected portraits of well-known or notorious clients in order to attract attention. The exhibitions helped him acquire a national reputation, and he was invited to become a founding member of the Royal Academy in 1769. 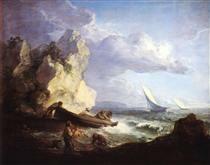 His relationship with the academy was not an easy one and he stopped exhibiting his paintings in 1773. 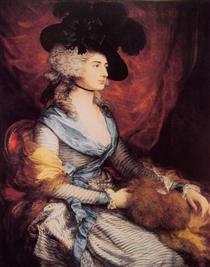 A Woman in Blue (Portrait of the Duchess of Beaufort) Thomas Gainsborough ?